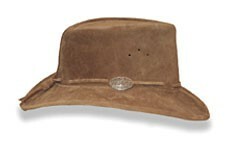 A stylish and popular suede hat that oozes the “outdoors”. A medium sized, reinforced brim that offers good protection from the sun. It has the thong hat band.